Things have come a long way since our kids were little. I think that every time we pass a mom with one of the fancy newfangled strollers. They’re so big and sturdy, strong, yet light-weight. I especially love the incorporation of the infant car seat as a stroller attachment – so practical. I have this same feeling of . 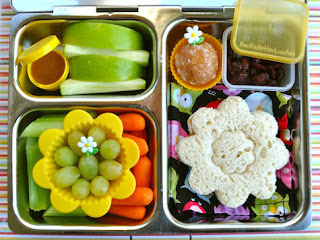 . . envy, I guess you would say, when I hear my friend, Rachel, talking about her son’s lunch box. It’s one of the expensive PlanetBox kits. The cost seems to be the only downside; the smallest box starts at $35. On the plus side, the boxes are stainless steel and will last for years. If you’re thinking that tastes and fads change and kids enjoy the treat of a new lunch box at the beginning of the school year, they’ve got you covered. The boxes can be decorated with magnetic panels that are interchangeable. The individual compartments do away with the need for plastic wrap, baggies, and single serving containers. Rachel’s son has severe allergies, and she hoping that the serving tray aspect of this lunch box will prevent cross-contamination with foods in the cafeteria that might cause a problem. The sectioned compartments are reminiscent of the Japanese bento box, and American moms are emulating the Japanese homemakers in styling the food for very striking presentation. If it gets kids to eat their lunch, I’m all for it. The PlanetBox website will give you suggestions and Pinterest is teaming with ideas. One of Rachel’s friends lamented on facebook that her husband thought she was going overboard when she filled a piping bag with mashed sweet potatoes when making school lunches. I think it’s a cute idea, encouraging a lot of creativity in the kitchen! If you want to take things a step further, you can buy Lunch Lines – a paperback book with pull out pages, 180 jokes ready to go!